Our foundations were in the commercial market and we have enjoyed over 40 years successful trading in this sector, which is a testament to our uncompromising levels of service. Since our early days we have worked with the most highly regarded specialist commercial insurers, earning a respected and enviable position within the market. We work at local, national and international level dealing with all classes of business including Property, Business Interruption, Employer, Public & Products Liability, Motor Fleet, Marine, Transit, Engineering, Computer, Aviation, Bonding & Credit. Our clients range from Manufacturing, Warehousing, Contracting, Boatyards & Marinas, Hauliers and Hotels to name but a few. We will place your business with the most appropriate insurer offering the widest possible cover and make sure that you keep fully up to date with legislation and risk management. If you are to ensure that your business is properly protected, seeking expert help and advice is not just prudent – it is essential. For a quotation or report on your insurances, please telephone and speak to one of our advisers. 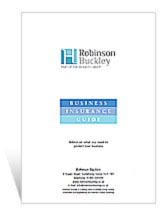 Robinson Buckley is a trading name of Headley Group Limited.